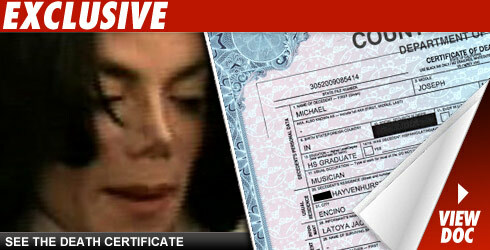 We've obtained a copy of Michael Jackson's death certificate. On cause of death, it says "deferred." It does say Forest Lawn Cemetery was a "temporary" disposition of the body. As we first reported the body will not go back to Forest Lawn. Final burial is pending at an unknown location. Jackson's occupation is listed as "musician." The type of business is "entertainment." Years in occupation -- 45. As for race, the word "black" is written. The informant -- the person who gave the information for the death certificate -- is listed as La Toya Jackson. The place of residence is not listed as the Holmby Hills home -- rather, it's listed as his parents' home in Encino.